December was a blast here at Adore Cosmetics headquarters — our two cherished gold masks were recommended by celebrities and world-class publications across the web and even print — and we celebrated with Santa all month long! We’ve got the 4-1-1 and lots of details to keep you entertained so read on. E! 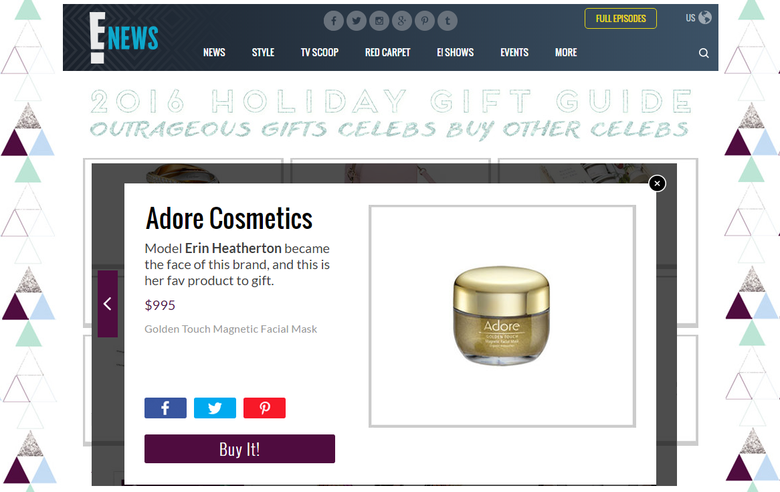 Online featured our world-famous Golden Touch Magnetic Facial Mask in its “2016 Holiday Gift Guide: Outrageous Gifts Celebs Buy Other Celebs.” E! Online shared that supermodel Erin Heatherton, who is also the face and brand ambassador of Adore Cosmetics, loves to give our gold mask to friends as a lavish gift to spoil them! Refinery29 featured our Golden Touch 24K Techno-Dermis Facial Mask in “The Beauty Products On The 1%’s Holiday Wish Lists” after Mario Dedivanovic, makeup artist to Kim Kardashian, Demi Lovato, Kate Bosworth, and more, raved about the mask in social media. 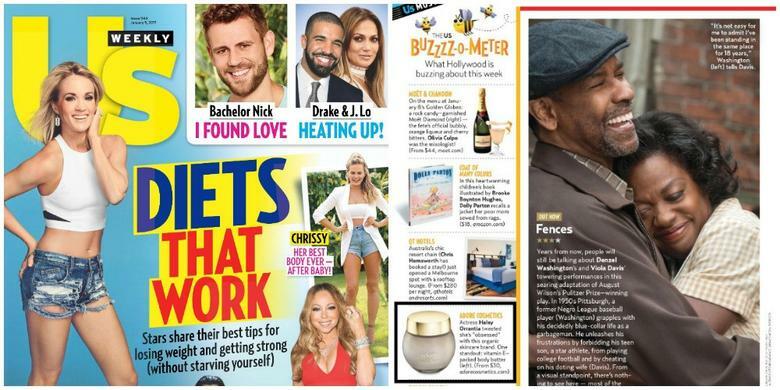 US Weekly print edition featured our Spirit – Calming Body Butter and Nature – Intensive Body Butter in its Buzzz-o-meter section! We covered it on our Adore Cosmetics website here. If you need to moisturize (and who doesn’t, especially in the winter!) give these babies a try — you’ll love them! Celebuzz featured our in its “28 Swoon-Worthy Holiday Gifts for the Makeup Lover and Beauty Junkie” section, ranking our Adore Calming Peeling Scrub & Body Butter Holiday Set as #11. That set was a holiday special, but you can still snag our Adore Calming Peeling Scrub & Body Butter on their own! Teen Vogue highlighted our other famous gold mask — the Golden Touch 24K Techno-Dermis Facial Mask — in its “Best Splurge Beauty Holiday Gift Ideas 2016” section. We’re with you, Teen Vogue! Like E! Online, Byrdie talked about our world-famous Golden Touch Magnetic Facial Mask last month, mentioning it in its “9 Outrageously Luxurious Beauty Products for the 1%” article. Adore Cosmetics opened two new luxury boutiques, both in Canada. Specifically, residents and visitors of British Columbia’s Tsawwassen Mills and Oshawa Centre in Ontario, Canada will now be able to lavish in the spa-like experience these boutiques provide to our cherished customers. Are you in the neighborhood? Hop on by! If not, check out our other locations worldwide here.